At Pomo d’Oro (11 Skaramanga Square, tel. 26610-28.680), chef Aristotelis Megoulas has created a menu focused on quality ingredients and balanced between local tradition and modern European cuisine. He uses the catch of spearfishermen and vegetables produced on small farms in his recipes. The homemade nombolo (smoked pork ham with crab apple and spicy mustard) is exceptional, as is the souvlaki variation filled with snail, shrimp, artichoke, mint and chervil. At Venetsianiko Pigadi (1 Desylla Ave, tel. 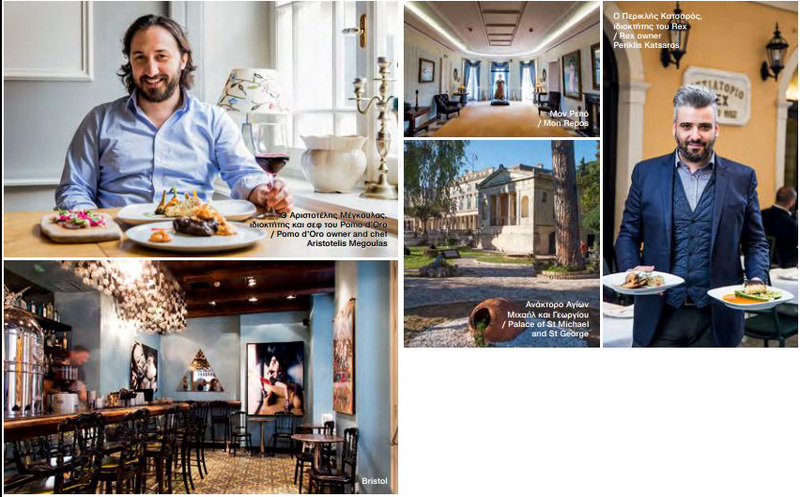 26615-50.955), operating in a 17th-century Venetian building on charming Kremasti Square, experienced chef Yiannis Vlachos offers high-standard Mediterranean cuisine. His lamb with eggplant purée and fig chutney, slow-cooked in a vacuum sealed bag for 24 hours, and fregula, a Sardinian pasta with prawn broth, calamari and prawns, are two of his outstanding dishes. At Kathe Prama ston Kero Tou (22 Mitropoleos, tel. 26613-03.195) Spyros Afthinos, whose creations are inspired by the bistronomie movement, the ultimate international gastronomic trend, offers a highly creative menu that is immaculately executed. The beef tataki with red cabbage and yellow tomato marmalade, as well as the homemade spaghetti with vegetable pesto, dry myzithra cheese and cured pork, is remarkable. A new era has arrived for Rex (66 Kapodistriou, tel. 26610-39.649), Corfu’s most classic restaurant, whose menu was recently revised. Some old favourites have been kept on the menu. The fresh fish with stuffed courgette, bouillabaisse sauce with carrot and verbena is incredibly delicious. Mediterranean cuisine is served at Salto wine bar (23 Donzelot, tel. 26613-02.325), a place with a southern French touch. Its all-Greek wine list includes 150 labels while menu highlights include sautéed pork chops with mascarpone sauce, sage and fresh tagliatelle. Tavernaki tis Marinas (35 Velissariou, tel. 26611-00.792) offers the finest Corfiot homemade cooking. Specialties include scorpion fish bourdeto, a Corfiot fishermen’s recipe made with fish, olive oil, an abundance of red pepper, as well as pasta, all cooked in a thick and spicy sauce. Traditional cuisine is also served at the recently revamped Porta Remounda, also known as Taverna tou Barba (14 Moustoxidou, tel. 26610-22.658). La Famiglia (26 Arlioti, tel. 26610-30.270) is the place for pasta. Selections include rigatoni del Pollarolo, made with chicken, sage and Mavrodafni wine. 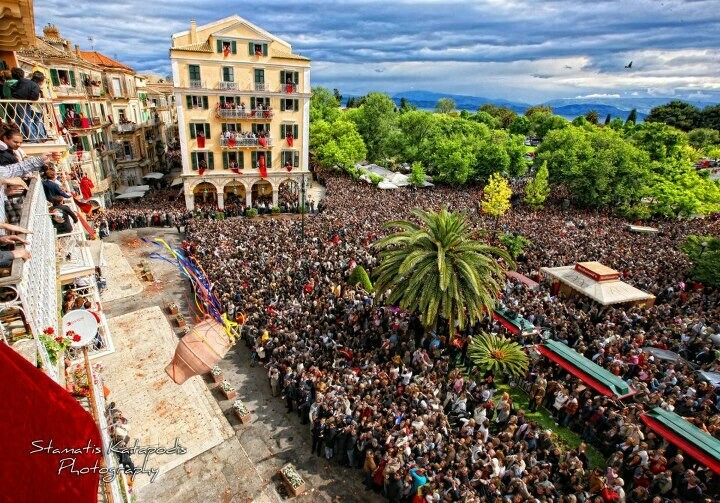 Easter events on Corfu begin to peak on Good Friday with the Epitaphios procession around the city’s districts, accompanied by philharmonic orchestras and choirs. On Easter Saturday, at 6am, a re-enactment of the earthquake that the Gospel says followed the Resurrection of Jesus is staged at Panagia ton Xenon church. At 9am, Agios Spyridon church stages its Epitaphios procession, while the First Resurrection service is held at 11am. Upon its completion, the bells at the Metropolitan Church of Corfu ring joyfully and clay pots (botides) are tossed from house balconies and windows onto the streets. On Easter Saturday night, the Resurrection Service is celebrated from an outdoor platform on the Spianada, before thousands of worshippers and visitors, with musical accompaniment from the philharmonic orchestras, while the lit candles on the square and in surrounding windows create a spectacular overall setting. On Easter Sunday, the city churches parade the Icon of the Resurrection around the streets from 7am. 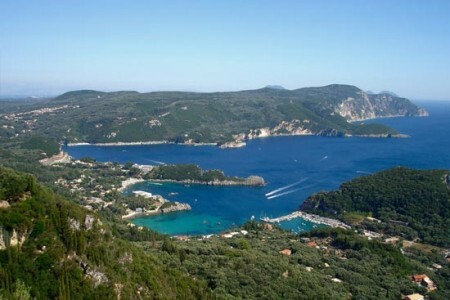 Rent a boat from central beach of Paleokastritsa or Liapades and in 5 minutes you can be in your Paradise. Virgin Earth. That is the name many of us would give! 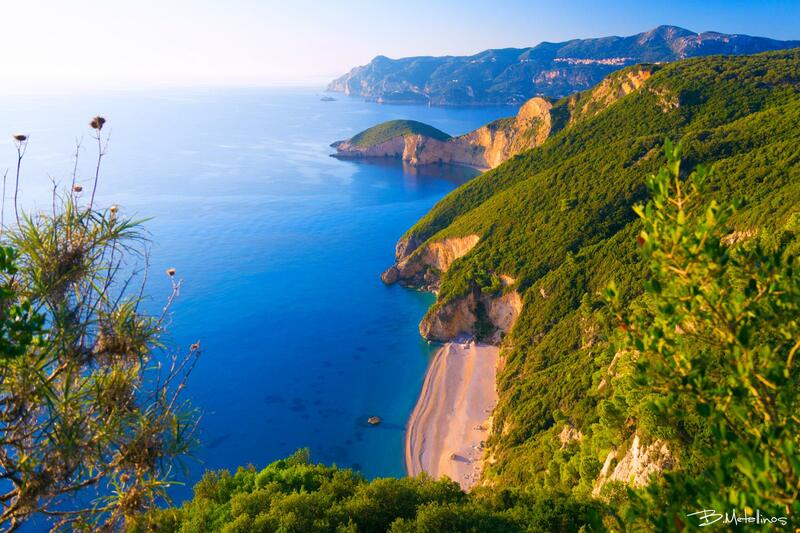 Chomoi beach near the village of Liapades and Palaiokastritsa, is one of the few hidden beaches of the island. The turquoise and crystal clear waters have been awarded with the Blue Flag, and you can see the reason. It consists mainly of pebbles and access become only by boat. You should have with you the necessities of food and drink. 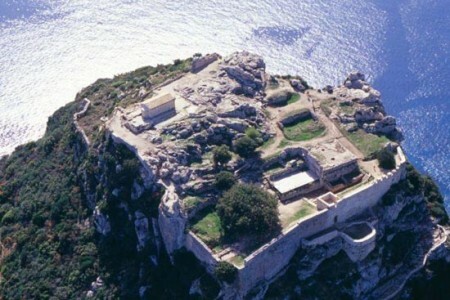 We advise you, if you are in Corfu, to visit it! Aggelokastro is the westernmost fortress of the Byzantine empire and the Despotate of Epirus, which included Corfu until 1267. Situated in the outskirts of Krini with a dominating position looking down on the resort of Paleokastritsa, Aggelokastro Corfu is considered to be one of the most important Byzantine fortresses to be found in the whole of Greece. The engineering of its construction in such a forbidding location is remarkable in any standards, not to mention medieval. 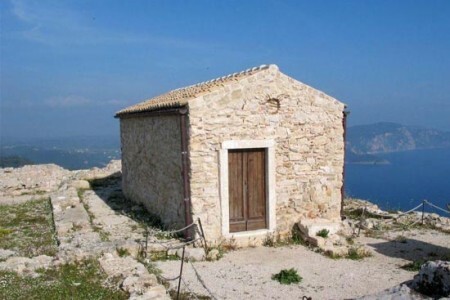 The fortress has now been renovated and you should definitely pay a visit to Angelokastro Corfu even if it is only for the stunning views over the west coast of Corfu. 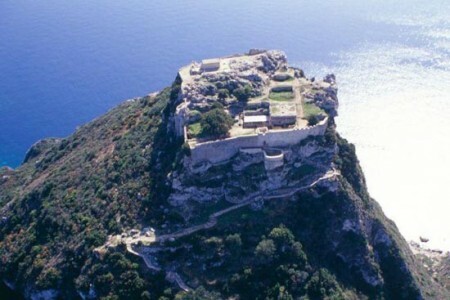 Due to the high altitude – about 300 meters above sea level – historically it has been the ideal spot to monitor the entire West Coast for hostile neighbours and pirates. During attacks the inhabitants of the local villages gathered within the walls of the fortress as there was enough room to hold them and their livestock and the nature of its location made attack almost impossible. 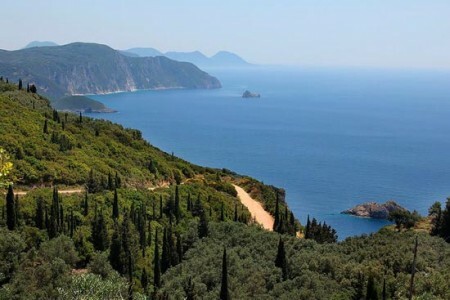 During times of peace the area around Angelokastro Corfu was used by the locals as an area for trade, commerce and worship. Archaeological digs have discovered artifacts dating to the early Byzantine periods between the 5th and 7th centuries which show that it has always been an important feature in this area of Corfu. There are two churches within the fortress. The church of The Archangels Michael and Gabriel was built on the site of an earlier three-aisle church and Aghios Kirakis which was built by excavating into the rock. This cave-like church is decorated with 18th century frescoes. The remains of a cemetery have also been found where graves were carved out of the rock, although the graveyard has still not be placed in a specific time period. Sensible footwear is required, because from the car park you have to go by foot. It will take at least one quarter of an hour climbing a very steep and rocky path before you reach the top, however once you catch your breath, you will be amply rewarded by the breathtaking panoramic views around you. There are some strategic points where you can look straight down to the beautiful clear blue water crashing against the rocks. It is truly amazing but definitely not for people with vertigo. Angelokastro Corfu is definitely an intense experience! Currently only open May–Sept Mon–Fri 8.30am–3pm. Is only 18 minutes away from Liapades in the north and it’s accesible by car. Following direction for Paleokastritsa and before it turn right for Lakones Village and then turn left for the Village Krini there you will find signs for the monument Aggelokastro Castle.